Do you often make notes? Want to save papers and use digital LCD writing pad instead? No matter where you are, these digital writing tablets will help you draw, take notes and even use as a practice tablet for your kids help learn. These pads provide a bright writing view and made up of a liquid crystal display which is powered by a coin cell battery again which lasts for a year or so. 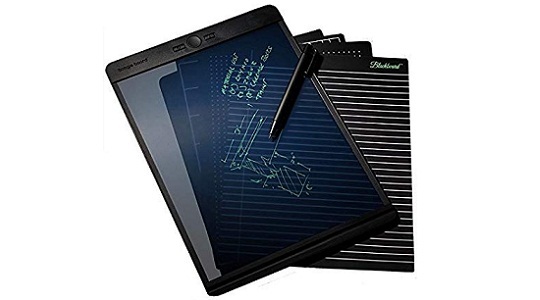 While most of the e-pads only support write and erase function, these latest tablets have the capability to sync and store the written data using smartphone apps such as email, google drive, and Evernote. Not only this, these pads feature pressure sensitivity so that you draw thin and thick lines to get a real working feel. We might not recommend these e-pads for professional drawing and color work but surely a productive tool for day-to-day writing notes taking and basic drawings. 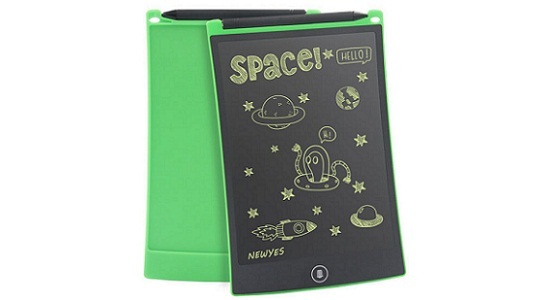 With these pads you can quickly take notes, your kids can draw and scratch stuff to learn, has an easy button to erase everything quickly and hence keeping things clean without having need of ink or chalks. A perfect tool for all the ages and very helpful saving papers. If someone has a talking issue, they can communicate with it easily. 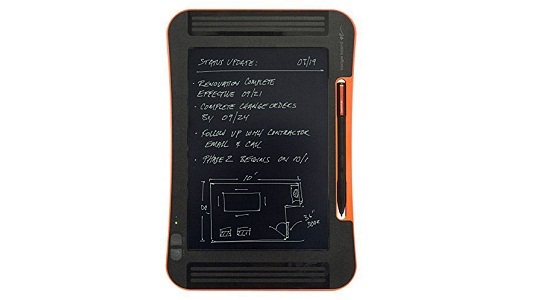 In this article, we have summed up some of the best LCD writing e-pads/tablets available now. 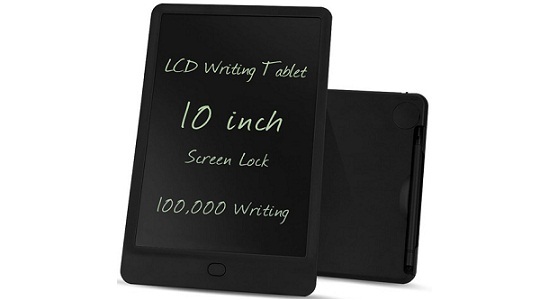 A popular choice in LCD writing pads and comes with 8.5-inch display size. This pad also features a grid-like background which is helpful for writing evenly on the surface. 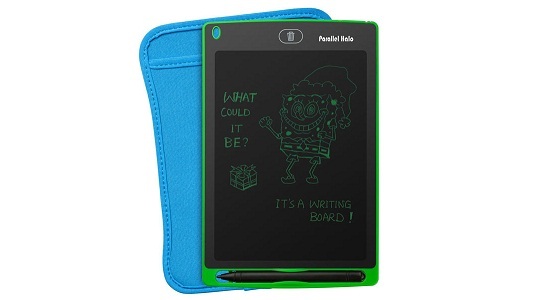 If you are looking for a notebook like writing experience, Boogie Board is a good choice. Available in various colors like black, cyan, and pink, etc. 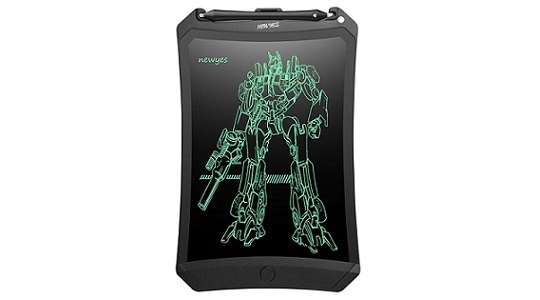 its ultra-thin plastic profile is easy to carry and has a battery housing which runs for years. 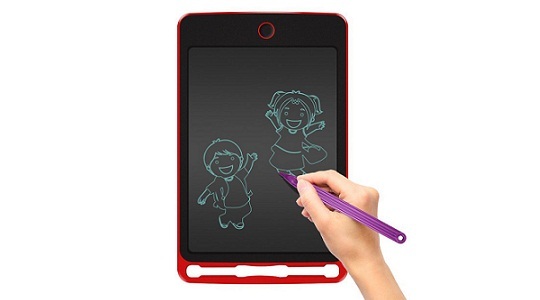 Especially featuring auto-correction, this easy to use drawing tablet is a handy tool for most of all ages. with a futuristic design, and an ergonomic stylus this is a perfect writing tab for education purpose. This writing pad also has a higher display 15" version with similar functions. 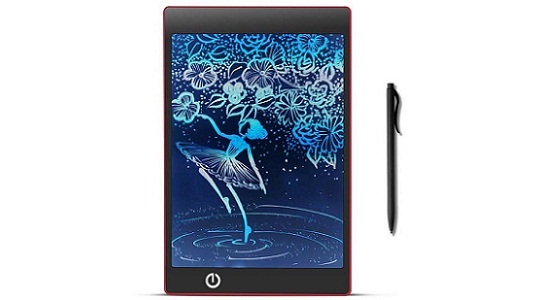 Some of the attractive features include a bright writing display, latest design, easy stylus, appx. 1,00,000 erase per battery, accidental lock button, two magnets, and an easy pen holder. 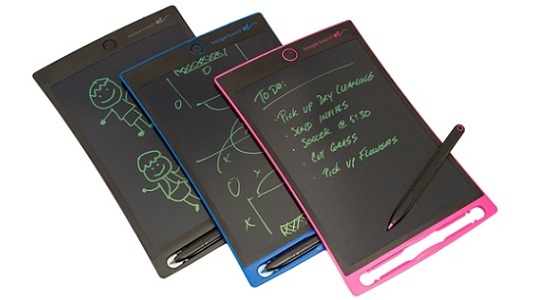 With better productivity features and some advanced functions, Boogie Board takes an edge. It can nicely sync to smartphones or smart devices over an app. Whether its an email or to share your notes, this board can sync everything you make on it. Looking at its specs, it has 9.7-inch reflex LCD panel, Bluetooth, 1mp camera, 1 CR battery and a stylus. Saving is pretty simple as a click. You can use a Bluetooth or a USB wire to transfer your saved data. It also supports Evernote. It's kind of a professional tablet. Slightly priced higher, Boogie Board Sync is highly recommended for professionals and students. Yet another upgraded writing tablet from best brand Boogie Board offering you a 10.5-inch flat tab with an extremely thin profile. At the top, you have an eraser button and a pen holder. This board needs 2 AAAA batteries which last for up to 50,000 wipes. You also have a lock button for against an accidental erasing. It works with your finger too. With a bigger 12" display, Alpharn digital writing pad eases the work. It is powered by a 3V coin replaceable battery and works for almost 50,000 wipes. Made with durable ABS material, superior writing screen, and easy stylus, this pad becomes a top-notch recommendation for students and kits. Overall, Alpharan is an easy choice for most of the working people and students. 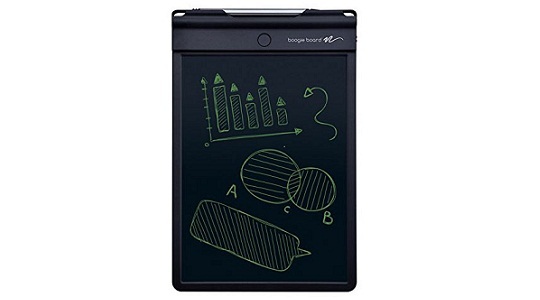 The Blackboard by Boogie board features advanced liquid crystal display with 8.5x11" writing surface. With this, you can erase a specific part of the board as an exact erase. You need to calibrate it once to start working. Just make sure to turn off accidental lock button while calibrating. 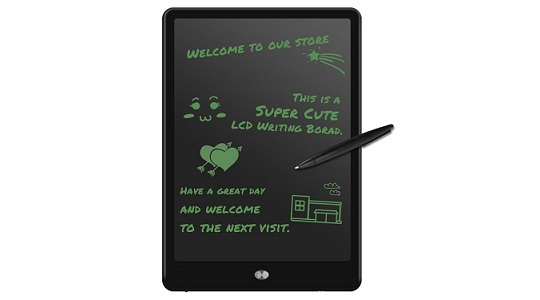 As a liquid crystal display, you have more background features such as line, dot, planner, and blank. Powered by a long-lasting CR battery this is a well-designed writer and works with iOS and Android apps for sharing, scanning and using its own features. Yet another product to help you write and note easily. This 8.5-inch LCD writing pad has a sleek design with the ability to save thousands of pages quickly. It has a low power consumption design which helps it last long up to 50,000 wipes for a single battery. With just 0.18 inch thick and 0.24 pounds in weight, this lightweight pad is very helpful carrying anywhere you go. You also get a 1/4 inch magnet to stick it on a metal surface. Parallel halo features a beautiful liquid crystal display with 8.5-inch display with a sleek design. Available in a green and white color you can easily write your grocery lists and attach the board to any metal surface such as your fridge door easily. 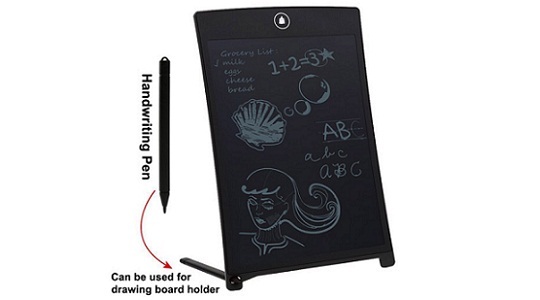 An easy writing board with LCD display with better readability than those paper looking boards. 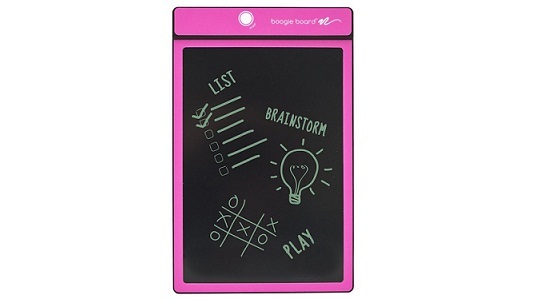 Boogie Board's Scribble n play is an innovative and colorful tablet specially made for kids. 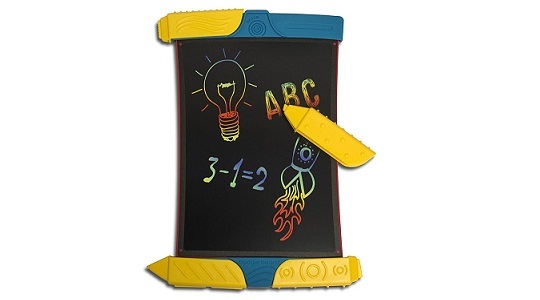 You can write in various colors such as blue, yellow and orange, which is a seriously cool thing for kids. You get different chalks to shape stylus with different tips to create a variety of lines. Again, the board works also work with your fingertips, so no worries keeping pens on a place. Moreover, this board also support iOS app to sync and share your kid's creativity with others. In short, a great board product for your little ones. 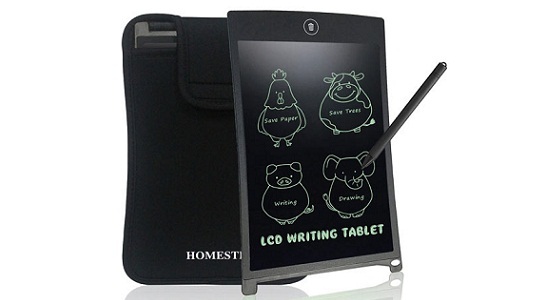 This writing tablet is a product of Hong Kong based tech called Homestec, offering you yet another writing board choice. It is smart enough to deliver the real paper and pencil using experience and available in various colors. It has a pressure sensitive screen which draws different thickness lines with our hand pressure. Again a good board for kids looking at its easy features and color options. It's a cool looking and eco-friendly cheap writing board, and a perfect suite for regular users like students, kids, teachers, and designers to create drafts, notes, designs and much more. It's 12-inch big liquid crystal panel makes things look super sharp and easy to manage. Powered by a regular 3V coin battery it lasts almost for 50,000 wipes. It's con include its no ability to save your notes, meaning if you press the erase button, everything will vanish. So be careful. Its special features include its waterproof IPX5 certification and company gives 30 days money back warranty alongside 1-year guarantee against technical issues. With an easy ergonomic design and firm grip to avoid slipping, Sarki is a reliable product. With plastic built design and pressure sensitive LCD this one is a workable board for daily use. its radiation and a glare-free display is a super gift for long hour users. Easily replaceable battery, wipe cycle of 1,00,000 and professional suitable features are some of the eye-catching features. Sakri board has 10" working display area, a clear button, and lock switch to prevent accidental erases. Its cons include its inability to save data, otherwise a great cheap writing board for regular short time note taking. If writing board isn't just note taking for you and like colorful work, then Eschone might suit you. With colorful display and vivid LCD, this board this board is a good choice for designers who do just something more than note taking. Professionals and kids of all ages can use this colorful board to boost their creativity. Best choice $20 colorful board. With sharp 8.5 inch LCD and available in red, black and blue built, YonRui is another good choice at a budget pricing. With a higher rating and above average pricing, M.Way is a choice for premium users. Design wise it looks like an iPad, but specs wise it is just similar to other products. 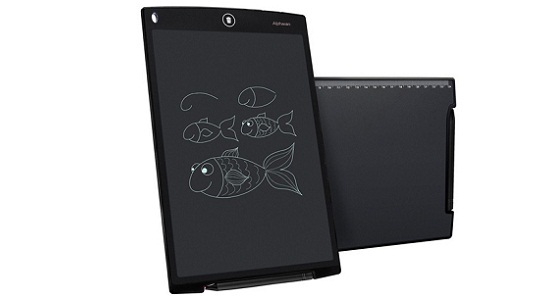 It has an awesome touch sensitivity and a perfect choice for calligraphy, drawings, artist, and design work. Want something different? 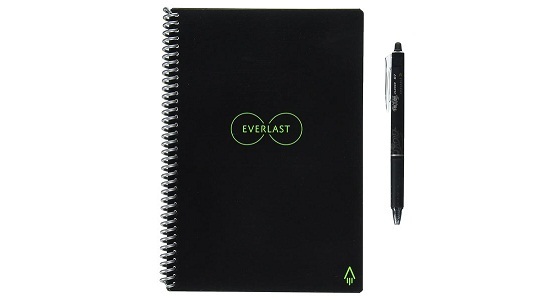 The Rocketbook Everlast can be used to review previous notes again and again. As its name suggests, it saves all the notes you wish to save in its memory for later use. Looking at this feature, this could be a perfect choice for technical people including day to day accounting, businesses, and ideas which comes to mind. Rocketbook App is another feature using which you can sync everything you created to your smartphone, pc, and other smart devices. It will automatically sync your notes and drawings to google drive, Evernote, Dropbox, icloud and more cloud servers. So, like this special mention? We recommend Everlast to many professionals who do not want to waste time in transferring data to pcs and phones for later review. It's quick and highly productive way to track notes and drawings. Which one suits you the most? If you have opted for any other product and using for a long time, let us know by email to update this list.